The patented 300 Series machines comply with OSHA fall protection standards. It offers a patented perimeter guard rail, a 14′ guardrail at ridge or eave of the building, and a rear 6′ extension that defines a guarded work zone for roofing. The installed system meets ASHRAE 90.1 standards with u-values obtained by a computer model, ANSYS finite element analysis validated by hot box test ASTM C 976. ELAMINATOR® provides a High-R application for new construction without support wires or structures below. The ELAMINATOR® system reduces the compression above the purlins, because the first layer of insulation is installed between the purlins. 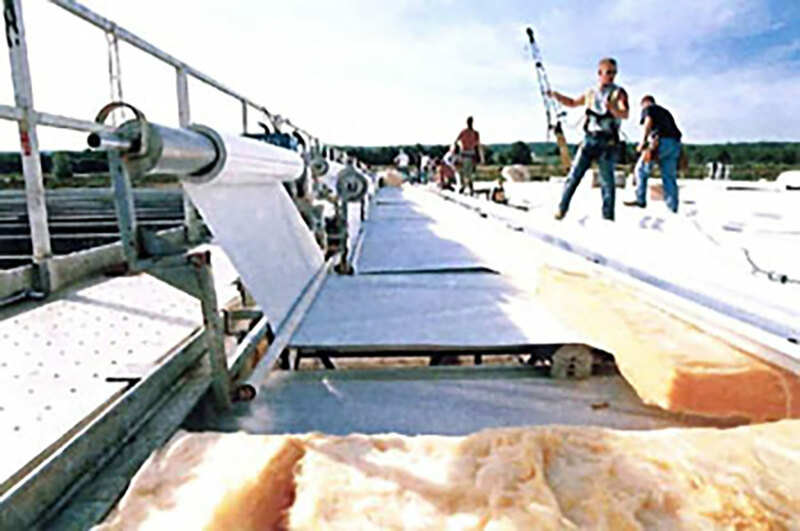 A layer of backfill insulation is placed over the purlins to ensure complete coverage by the insulation. The ELAMINATOR® provides a system with facing seams lapped over the purlins where they are not exposed, which makes for a clean, seamless appearance.